When it comes to my layered paint treatments, I do a lot of improvising. I've been getting emails asking me for ratios, etc. Most of the time, I can't give you one. I seldom do exactly the same thing twice. I tweak, change course, add, subtract, etc. 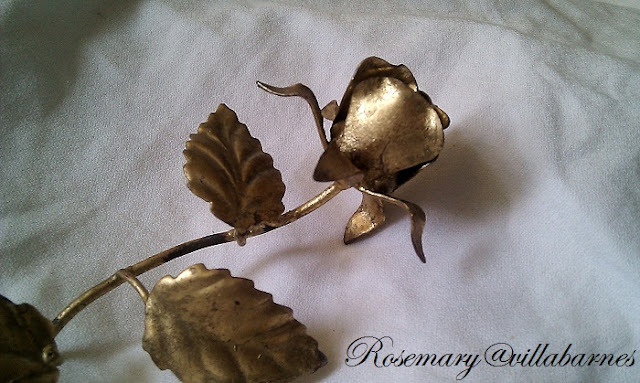 looked like this salvaged gold rose I just sold. I wanted a layered chippy finish. 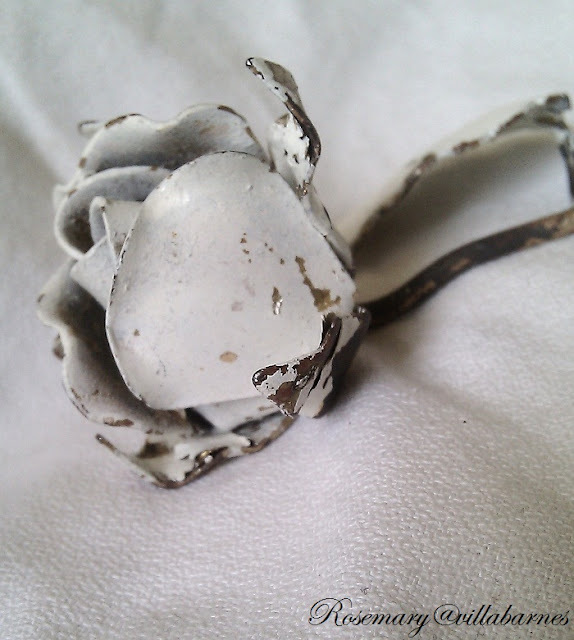 I gave it several layers of matte antique white paint, and did some bending, chipping, and distressing. I wasn't sure how it was going to turn out, but I just kept going until I was happy with it. I went further with the distressing in certain spots, but made sure the predominate color was white. 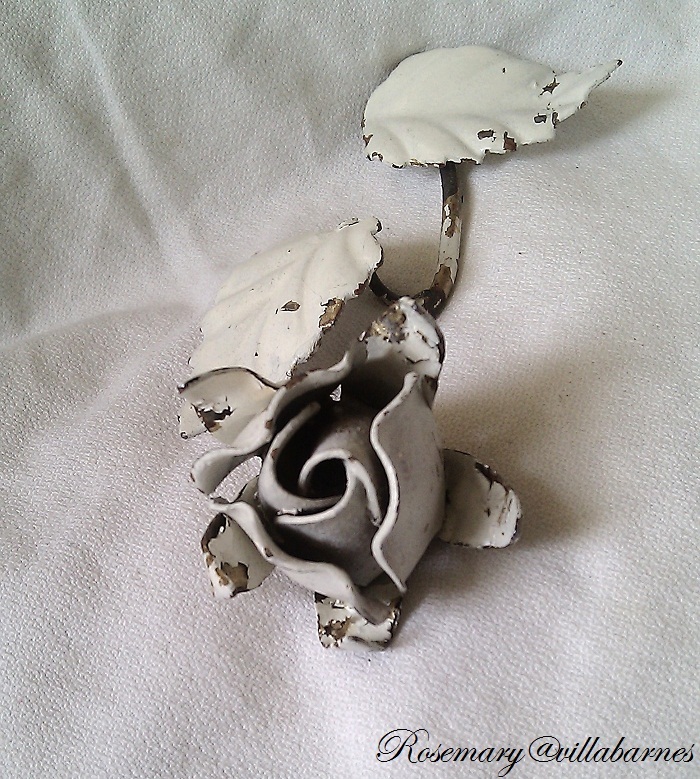 This metal rose is another salvaged piece. I wanted to give a very plain frame a little more character. Sorry, no before. 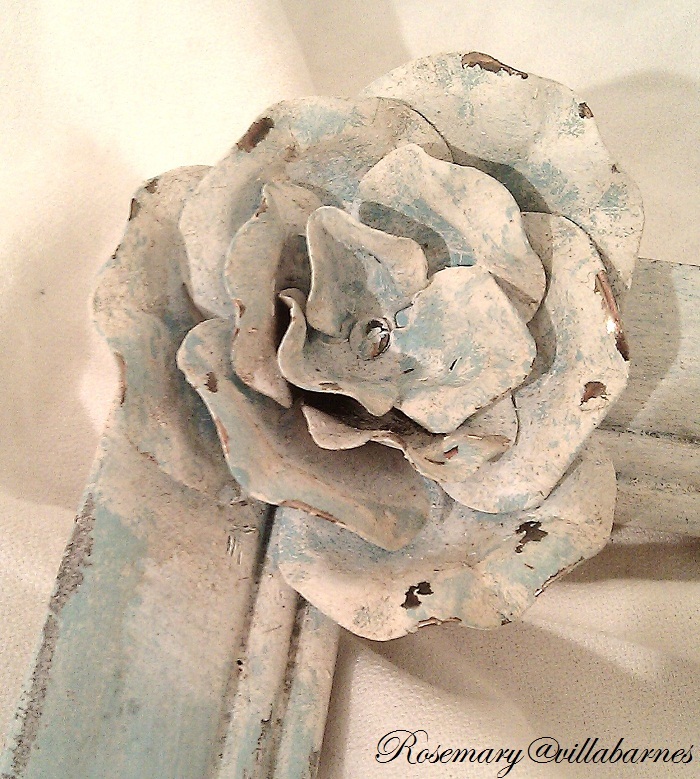 I attached the rose to the frame, and alternated layers of white, grey, and aqua over the entire piece. Lots of dry brushing, and distressing gave me this. 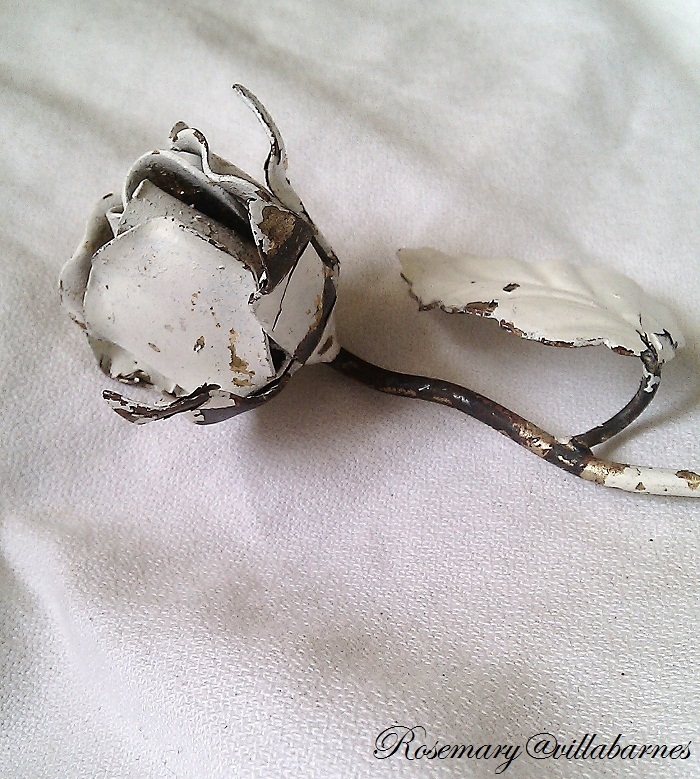 There was no bending involved with the rose. I chipped the finish with a file, and my fingernail. So, experiment, improvise, and take a few chances. You just might get the finish you want. See ya soon. Beautiful Rosemary! I know it's hard to say exactly what you do.When your an artist you just go with each piece.It sort of speaks to you.At least that is how I am.You do a great job of explaining what you do.Thank you for sharing!Hope your keeping warm.Were getting back to our January weather tomorrow.And getting snow tonight! I love the color on the frame with the rose. Very nice! so gorgeous, the perfect chippy factor! Oh, I like! That frame is especially nice! 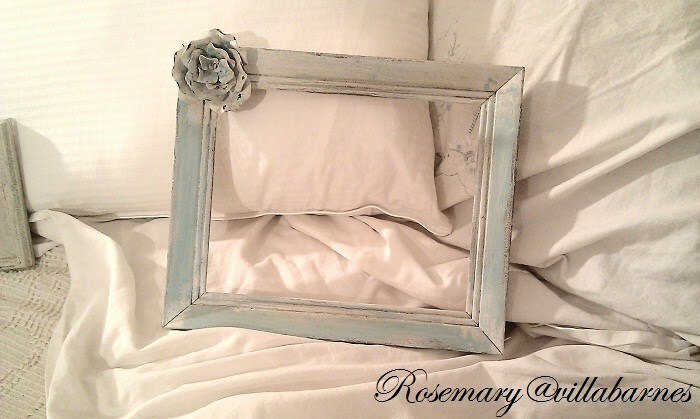 I love the frame Rosemary! Love the color of it also. I had the gold tole rose in my Etsy favorites but someone beat me to it:) Love the painted one! you are amazing, and much more patient than I would ever be. PS all perfectly chippy and wonderful! Whatever formula you use, your projects always inspire. Love the chippy no fuss look. Do you fingernails look anywhere near as awful as mine? They are the best paint treatment tools! So, what you are saying is work the piece, step back and look at it and work it a bit more until you get it right? 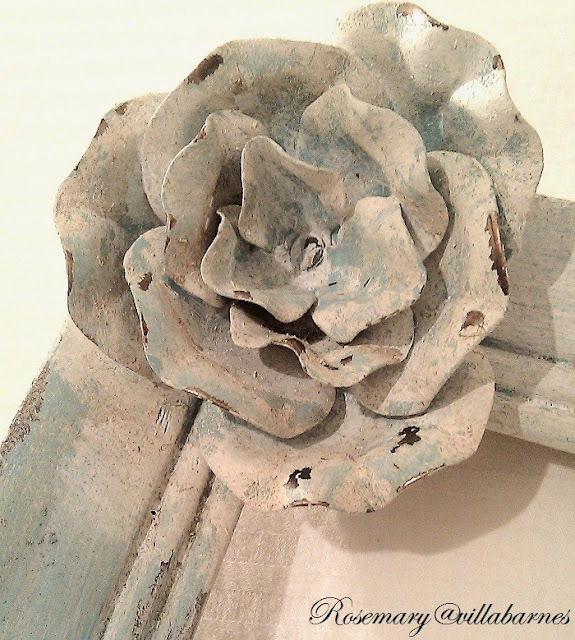 Just gorgeous, The rose is so neat and that frame is just lovely. All of your work is very pretty! I love the frame. 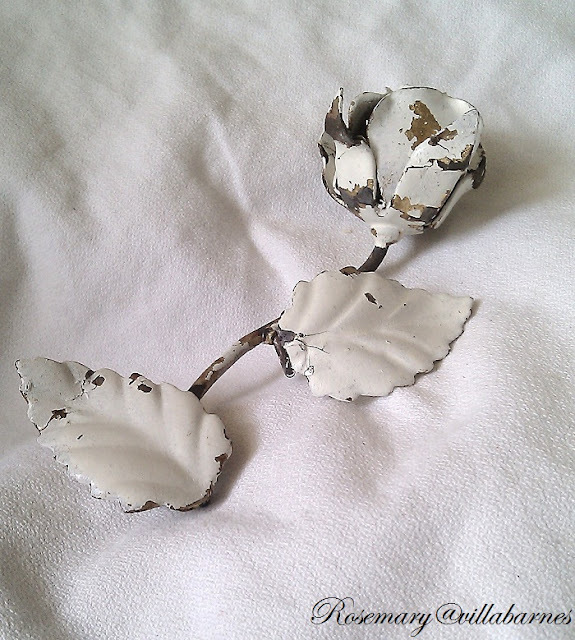 I love your chippy roses Rosemary. The fame is another gorgeous piece.